The Stair Barrier is a great device, designed to make stairs safer for your pet! Get yours TODAY! Keeping furry friends off the stairs is a key part of safety-proofing your home, but most safety gates are unsightly or industrial-looking at best. The Stair Barrier, with its wide selection of fabric gates designed for the bottom of staircases, offers a better solution. The easy-to-use, attractive gate makes the stairs off-limits to young kids and curious dogs while still making it possible to welcome guests in style. Designed by a mom who wanted to keep her own children and dogs off of the stairs in a way that looked as good as it worked, The Stair Barrier is the first and only fabric safety gate designed specifically for the bottom of the stairs. It is also the only gate with both banister-to-banister and banister-to-wall options that can be mounted on an angle. 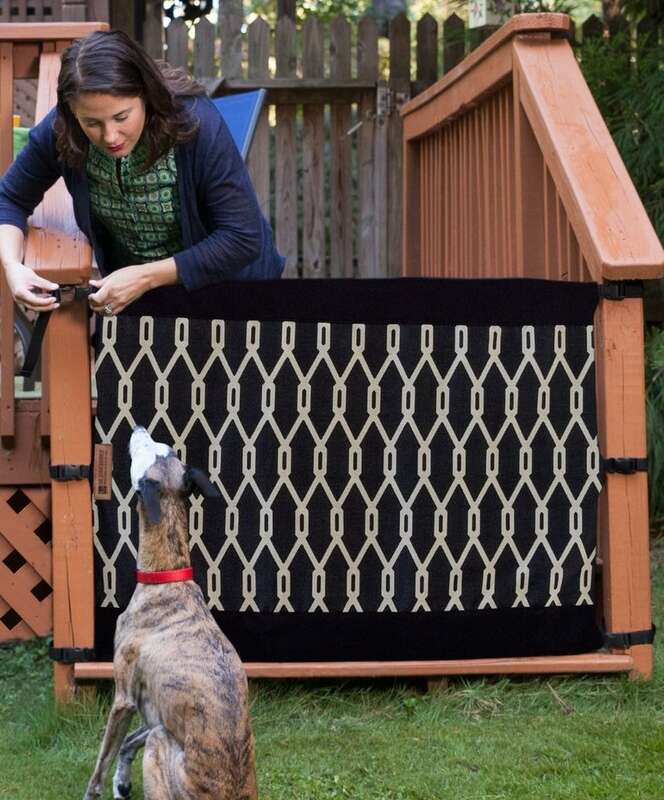 Mildew and weather-resistant fabrics like the Indoor/Outdoor Black and Indoor/Outdoor Onyx (shown below) make The Stair Barrier a solution for keeping dogs off decks and outdoor staircases too. Installation of Stair Barriers is easy and non-invasive, requiring no drilling or extension kits for the Banister-to-Banister style. Banister-to-Wall gates require minimal drilling and arrive with everything necessary for installation. 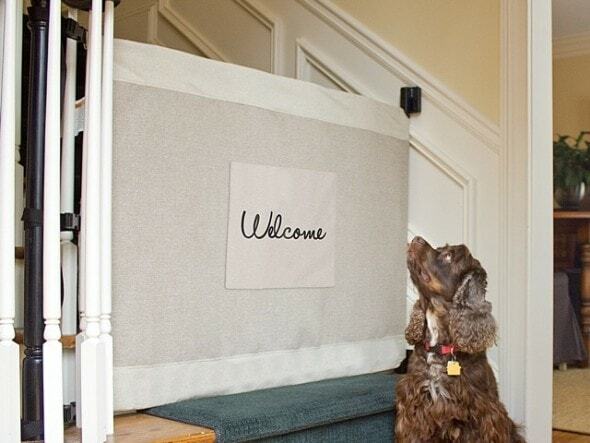 The Banister-to-Banister travels easily too for vacations with the dog and visits at the homes of friends and family. The Banister-to-Banister gate weighs only six pounds and easily rolls up for travel. An optional over-the-shoulder carrying case is available. The Stair Barrier is offered in a variety of high quality upholstery fabrics. The barriers are 32 inches tall and come in regular and wide widths, ranging from 36 inches to 42 inches for regular, and 42+ to 52 inches for wide. Internal plastic struts and horizontal webbing that run the width of the gate, from buckle to buckle, give the fabric gates an extremely tight fit, which prevents gates from sagging and dogs from sneaking under. The company’s Custom Division enables The Stair Barrier to provide a solution for staircases wider than 52 inches. Customizable options, such as a family’s last name or a warm “Welcome!” message, allow for a personal touch. The Stair Barrier is sourced and manufactured in the U.S.A. and offers many fabric options made with REPREVE, a leading producer of recycled fibers derived from plastic bottles. For more information and a look at all of the fabric options, visit The Stair Barrier’s website and like The Stair Barrier on Facebook to get a first look at new products and sales.